Welcome to The Abso!ute Sound online! We explore music and the reproduction of music in the home. We believe that the sound of music, unamplified, occurring in a real space is a philosophic absolute against which we may judge the performance of devices designed to reproduce music. Our goal is to provide the resources consumers need to judge how a component's sound either honors or departs from the music's truth, and to make sound purchasing decisions that maximize their experience of reproduced sound. Below is our Issue 141, April / May 2003 table of contents and editorial. 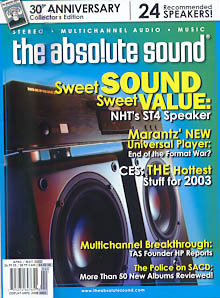 Step into the TAS time machine with this classic review from Issue 11 —Harry Pearson on the Beveridge electrostatic speaker system. Here ’tis, our latest list of favorite high-end loudspeakers. Our annual trek to Las Vegas brought us to one of the best shows ever. Our report describes the highlights and, we trust, will whet your appetite for future reviews. and talks with designer Jack Hidley. “Universal” disc players are suddenly hot items. Alan Taffel checks one out. Neil Gader on the latest serious yet shrimpy speaker from ProAc. This mid-priced German design has a lot to offer music lovers, says Allan Freeman. Sue Kraft takes a listen to Ayre’s entry-level CD spinner. special-edition offering from Denmark’s Dynaudio. Aaron M. Shatzman takes another turn with EAR’s Mazda-equipped 864. KEF is back in a big way, says our man in the field Anthony H. Cordesman. Find out why Jonathan Valin compares Audio Research’s Reference Phono preamp and Clearaudio’s HarmonyMg cartridge to Chinese puzzles. the Soul Generation traverse unusual musical ground. Editor Wayne Garcia on a personal journey to The Absolute Sound.